What a treat when J.Crew revamps and revives popular pieces from seasons past. Take it from the girl who owns the perfect shirt in three different colours; it’s pretty much the closest thing to perfection you’re going to get in a tailored shirt. 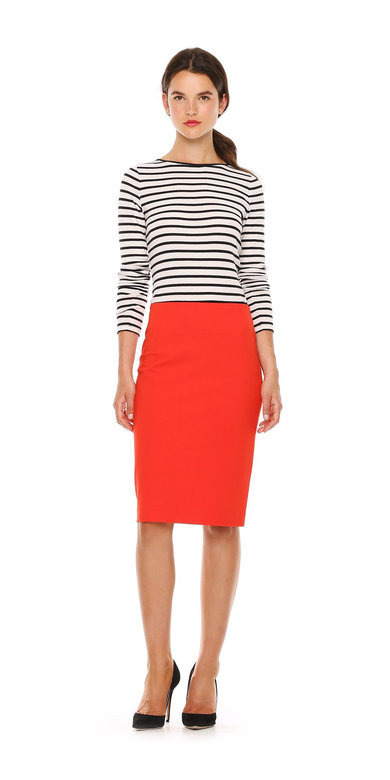 The marina-stripe perfect shirt by J.Crew is a must-have for every season. For summer 2010, J.Crew’s taken the classic and added a couple of little extras: More precise darts at the bust and waist and an improved washed cotton voile for lightweight wear. The deep atlantic blue juxtaposes banker professional with effortless elegance. Pair with black crop skinnies and brogues for a look that channels timeless beauty Audrey Hepburn. Just be sure your shirt is freshly pressed – wrinkles are a serious faux-pas when it comes to styling classic chic. I love almost anything J.Crew, but I think I’m loving this button-down because it is such a departure from J.Crew’s typical professional dress shirts. First, the fit is different – The fit is slim-lined to hug the body just slightly more than a boyfriend shirt. Second, the fabric — Shimmering cotton lamé is lightweight and perfect for when weather heats up. Third, the versatility — Most of J.Crew’s shirts are casual or dressy. This lamé slim shirt could work equally as elegant in an office environment as it could after hours. My only quam? I’m so over “dry clean only” labels. Functionality is where it’s at. 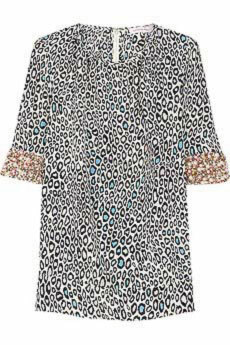 100% silk in a playful leopard print, this Dolce & Gabbana blouse is beautiful. I love the balloon sleeves paired with a flowing body, and how the blouse is semi-sheer to reveal whatever you happen to be wearing (or not) underneath. Side slits add versatility, so you can leave the shirt out or tuck it in. The button down placket leads up to a pointed collar, which is so small it almost looks mandarin in style. How surprised was I to find Mischa Barton wearing one of Matthew Williamson’s designs and not Sienna Miller? Leave it up to Mischa Barton to change her hair colour and her signature style; she stepped out in Matthew Williamson’s pearlescent cluster top, pairing the animal-printed silk number with a pair of wide-leg black pants. Paired with skinny pants or worn with a cinched waist over a pencil skirt, I think a woman could make this top work wonders, but pairing Williamson’s wild top with those pants reads more 70-year-old Grandma than 70s glamour. While I don’t love how Mischa Barton worked the silk shirt into her wardrobe, I do love how Williamson left the gold-tone back zipper completely exposed and how he designed the raised round neck. Would you ladies be caught out on the town in this top? Today over at online fashion community Coutorture, Jenny Flevin — the Senior Editor for Harper’s Bazaar – is acting as guest editor. Accordant with the release of Harper’s Bazaar Great Style, Coutorture is featuring tips and advice on personal style. Since my personal style is classic (with a twist), today’s post is dedicated to the classic white shirt. I love a crisp white shirt. It’s arguably the most classic piece of clothing a woman can own (next to the LBD, of course). A clean cut, collared white button-down is an essential element in a woman’s wardrobe. Most of the women I spoke to regarding this very post own at least 2 variations on the classic. Though the white shirt has been around for ages, Audrey Hepburn really helped popularize the look. Along with her signature capri pants and ballet flats, Audrey set trends and styled a look that would become timeless. Whether shooting a movie, posing for promotional photos, or working with UNICEF, the white shirt was ever-present in Hepburn’s wardrobe. The late Princess Diana was another fashion icon who always styled classic, and frequently did so wearing a white shirt. From her early days as wife to Prince Charles to her time spent working with the Halo Trust in Cambodia, Princess Diana used the white shirt to put together ensembles that were effortlessly elegant; ensembles that were copied by women the world over. 1. Pick a shirt that you know you’ll wear. Some women opt to wear an actual mens shirt, others opt to wear something fitted. It depends on your personal style; take a cue from what’s already in your closet. 2. Wear it with variety in mind. One day wear it tucked in, one day wear it over a tank or under your favourite sweater. Try popping the collar and folding up the sleeves. 3. Be wise, accessorize. The right accoutrements can take your white shirt from the office to the club (or wherever it is you hang out after hours). Buy a skinny belt and cinch it around your shirt. Try tying a colourful scarf around your neck or layering on a few strings of pearls. My favourite pick for the classic white button-down, hands down, is this cotton shirt from J.Crew. It’s designed with long sleeves, a point collar, and a shirttail hem; it’s a must-have for your wardrobe (READ: If you don’t have one already, head over to JCrew.com and purchase one). Whatever the reason, second-skin blend cotton/silk/wool wears just as well as cashmere, while maintaining an similar look. Choosing to wear it in a crewneck style, and in a classic hue, I’m taken back to the days when paparazi were following Audrey Hepburn’s every fashionable move — from Los Angeles to Lisbon. For a similar — and affordable — look, check out this high-quality sweater from Banana Republic, with 3/4-length sleeves and a ribbed trim. My Mum has always taught me that when you see something of significant quality, you should buy two. Or three. Or one in every colour available. 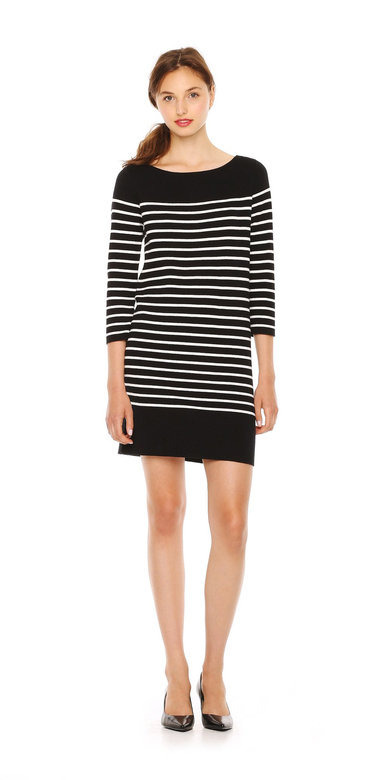 Created from cotton, rayon, and silk, James Perse tops are no exception. They’re the perfect mix of comfort and classic chic, paired well with your favourite worn-in jeans or a dressed-up skirt. James Perse tank, $88; long-sleeved tee, $50; v-neck tee, $44 at eLUXURY.com. Sure, it’s a shirt originally built for a man, but that’s what half the appeal is for the woman who wears it. Mademoiselle Chanel herself was legendary for taking her style cues from men, often wearing similar clothing and patterns not unlike those of her male friends. This Marc by Marc Jacobs cotton top will wear womanly for summer tucked into shorts, with cuffs folded up and collar unbuttoned. Wear with a bare neck or a statement piece of jewelry — either way, you’ll be a true classic. There are several reasons that I love this Cole Haan creation for spring. First, it’s Cole Haan. Second, it’s exquisitely detailed. Third, well, read on. 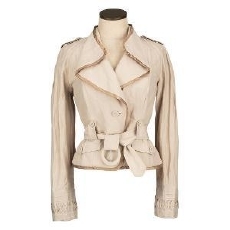 When I saw Cole Haan’s shirt trench, the short length and draped collar hit my heart spot-on. Because it’s not your average Burberry-esque lengthy long trench — not that there’s anything wrong with that — it exhibits a spirit all of its own, making it a unique addition to any girl’s wardrobe. 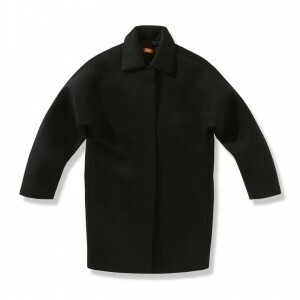 Wearing it around, I’ll be as bright and crisp as a beauitful flower, and the jacket’s soft cotton/polyester blend ensures that I won’t get soaked by any pending spring showers.